TigersLotto gives members the chance to win weekly, monthly and quarterly Mega Draw prizes for just £1 a week. Five lucky supporters each bagged £100 in this week's draw. Congratulations to Stuart Turpin from Leicester, Paul Butland from Market Harborough, Tim Brookes from Leicester, Neil Kingston from Wolverhampton and Ian Matthews from Market Harborough. Last weekend, Tigers fans Claire Belwood and Roger Ellis joined Tigers supporters in Belfast for the club’s opening Heieneken Champions Cup match last weekend, courtesy of TigersLotto and Thomas Cook. See how they got on by clicking here. TigersLotto rewards fans with the opportunity to win weekly, monthly and quarterly prizes ranging from £100 to money-cannot-buy experiences. The next Mega Draw prize is giving members the chance to win a table for 10 at the annual XL Catlin Six Nations Dinner at Battersea Evolution in London on Wednesday, February 27. Rub shoulders with rugby royalty at the black tie dinner previewing next year’s Six Nations in aid of the Matt Hampson Foundation. 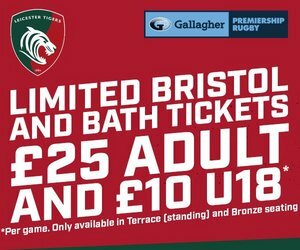 Sign up to the TigersLotto before November 30 to be in with a chance of winning. Find out more information by visiting the link below.